Made popular in the Northeast USA while trolling for Giant Bluefin Tuna, this spreader bar rig works extremely well for Bluefin Tuna, Yellowfin Tuna, Bigeye Tuna, Dolphin, and Billfish. These will raise fish (and hook them) when your other baits might sit quiet. I have personally been using spreader bar rigs since 1976 and I have caught many Giant Tuna on them. However, back then, we had no shell squid to use and we rigged up real ones. What a lot of work! You have the advantage of a "Grab n Go" situation with our rigs allowing you time for more important things than tying squids onto a rig. Daisy Chains have been used for decades, maybe even longer. I started fishing professionally in 1974 and they were being used at that time as teasers by Sailfishermen in South Florida. Many pros continue to use Squid Chains as their teaser of choice when “dead baiting” for sails. I rigged my first Daisy Chain with a hook in the tailing bait in 1976 on around July 6th in Gloucester, Ma. I was taught that day how to harness up Boston Mackerel as "teasers" and tie them with Dental floss to the leader ahead of a larger Boston Mackerel that I had rigged as a "hook bait" at the end. I rigged seven or so that day as they lasted around 5 hours each (at 5 knots) and we trolled three lines for Giant Tunas all day. The Daisy Chains I rigged put on a nice display splashing along in unison across the slick calm water in MASS Bay. It was a slow day for sure as when it became around 5:00 PM and we had gone all day without a strike, the captain announced we had "Five More Minutes". Well the fish must have heard him as around four and a half minutes later we hooked up! Not one, but two Giants! They got tangled and as I was a "Green" mate at the time, we cut one loose so as not to break them both off. The one we landed was a "rat" (small) but still weighed in at 410 lbs. This was my very first fish Giant and my first fish caught on a Daisy Chain. In the coming weeks, I rigged more and more chains, to the point where I could probably do it blind folded. We were catching around 1.5 giants per day averaging around 900 lbs each! This is when I became a true believer in Daisy Chains as we caught no fewer than 40 on Daisy Chains before we switched to chuming after the New York boats showed up. In July of 1980 I had given notice that I would be leaving my position as mate on the famed “Jersey Devil” captained by Ronnie Jones. We were fishing out of Hatteras, NC at he time. The owner decided to fly in for one last hurrah with me aboard and we targeted Blue Marlin on 6 pound test. At that time there had been none caught on 6lb yet. Well, Ronnie wanted no teasers in the water and wanted to put out only two lines, so everything that I would attract a Blue Marlin with would have to be at the end of one of two 6lb test rods. Consequently, I couldn’t put anything big out and had only two rigs in the water at a time. What I decided to do was dig out a box of small squid, the kind you use to drift for Stripers, or Snapper, etc. These were only around 6 – 8 inches long. If kept on the surface a Daisy Chain of these would not create so much drag as to bend the 6lb rods in half, so I started rigging up chains of three and four squids to create as much activity as I could without breaking the rods in half. Without going into detail, that day we: Caught 3 out of 5 White Marlin, broke off a 500lb Blue, came dangerously close to gaffing a 300 lb Blue, and free-gaffed a 38lb Dolphin. Not a bad day with only two baits out, huh? But we really had 6 – 8 baits out at a time, just off of two rod tips…. This Giant was caught using a Daisy Chain of six Boston Mackerel. 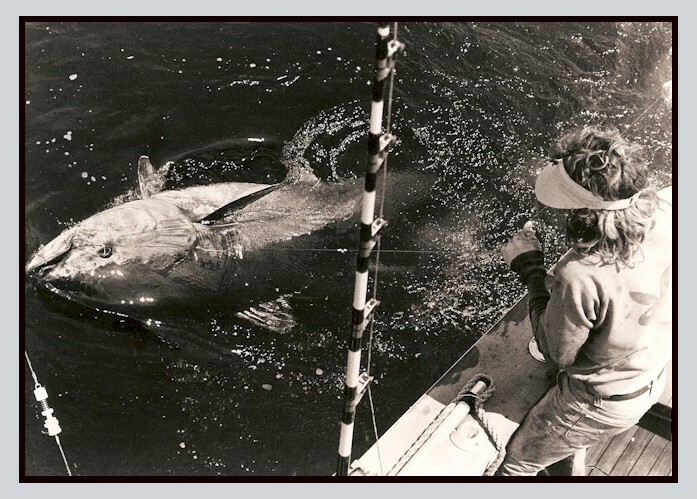 This is one of 40 or so Giants caught trolling Daisy Chains by the “RENEGADE” crew in July of 1976. Dave Adams (wireman) weighed around 115lbs and this fish was almost 850. IN or around 1978, someone came up with the idea of attracting more fish with even MORE bait in the water. I found myself as the mate now rigging up a 4 foot piece of welding rod tied to the leader with floss in the center of the rod. I rigged up a center Daisy Chain of six 18” real squids and two smaller chains to the left and right of center making a total of five chains being drug in unison on a single leader. We set up the squids in a reverse “V” pattern with the hook bait being the point or center of the “V”. This was extremely time consuming and used a lot of bait, but it was SUPER productive. It is so productive that this is still the rig of choice among northeast Giant Tuna Fisherman when trolling (except they are now using rubber “Shell Squid” and they do not need to make new rigs every 3 hours. In the late ‘70’s we used Boston Mackerel and large squid to rig our Giant Tuna Daisy Chains, but the captains had spoken about a particular type of rubber squid that used to be produced that was very productive, but they couldn't find them anymore. In the last 30 years more and more manufacturers have entered the lure market and many of us have made "Shell Squids". These have been sold to tackle retailers who produce both Daisy Chains and Spreader Bar Rigs, and I do not know of anyone who does it anymore the way we did way back when (with real baits) as (Good) Shell Squids are so productive. 1. The first thing you need to know, is that generally speaking, the first thing that attracts a fish's attention is not the trolling bait, but the boat, the engines, the prop wash, the "hum" as Alex Adler (a super pro fishing out of Bud & Mary’s in Islamorada) calls it. 2. After you have the fish's attention, and he looks up, if you have out three or four Daisy Chains, instead of seeing three or four single baits, the fish now sees a huge Buffet! “Whao! ?” The fish thinks, "Breakfast!" 3. When the fish comes up for a look at the buffet you have laid out for him he notices that there is a small predator chasing a group of smaller baits. Instinctively the fish knows that the small predator (your hook bait) is distracted by the chase he is on for a meal and the fish knows that this small predator is an easy target, so he jumps on it! The professionals that are winning (not just fishing) the major tournaments, are dragging up to FOUR Dredges. What's a dredge? It is a SUPER Umbrella rig with as many as 70 baits on it but no hook. These crews are fishing two on handlines from the corners, and two from electric teaser reels that feed line out low on each outrigger. Many of these guys are actually fishing real Mullet or Ballyhoo harnessing up each baitfish individually and re-rigging the whole thing every three hours. Not only is rigging them a full time job, but to actually put them out without tangling them into a ball, and then clearing them each time you hook a fish and re-deploying them takes a professional three man crew in the cockpit. These guys are going through all this trouble not because it is fun, but because it is worth it. Now, for us "Weekend Warriors" fishing with smaller boats and/or smaller budgets, it is not at all practical to go through this type of expense or trouble. But, what we can do to increase our chances is to deploy Daisy Chains and Spreader Bar rigs. While a Daisy Chain is incredibly simple and very economical, for a bit more money and a slight more effort, Spreader Bar rigs can increase your Buffet's size even more. Most Standard Spreader Bar Rigs have a total of 14 baits on it, so if you drag only one and two five bait Daisy Chains, you now have 24 baits running from three rod tips (instead of three baits). We've Never Done this before, Why do it now? Good Question.... But think about it. When I first started fishing professionally, Dolphin and Blackfin Tuna were everywhere and a slow day of Dolphin fishing out of Miami was 15 fish between 10 and 30 lbs, and now I would love to see a day like that on a consistent basis. We used to catch 20 Sailfish on a decent day out of Palm Beach on a fairly consistent basis just dragging around four live Goggle eyes from the flats and the riggers. Now most pros would be happy with a six fish day on the average. But, instead of fishing four live Goggle Eyes from the flats and riggers, the charter boats and pros are fishing kites, and NOT just one kite, but two or even three kites and rigger baits or flat lines. They may have 12 baits out instead of the four we used before. We would NEVER bother fishing kites out of Palm Beach back in "the day" but if you want to produce fish like the old days, you need to fish like the new days. Capeesh? We do it like this in New York…. Hmmmm, you would like to say if you want it that way, go back to New York, yes? The truth is that the fishermen in the Northeast, from Virginia to Maine, have long recognized and taken full advantage of multi bait rigs. I recently met a tackle shop owner in Long Island who fishes a 36’ center console. He told me his standard “spread” consists of eight Spreader Bar Rigs and five Daisy Chains. The reason they will fish this much bait simultaneously is that they will not usually be trolling an edge or weedline, but a color change or temperature change which will not be nearly as defined as a weedline off of South Florida. As such, they want to put on the largest show possible to draw in the fish that they will happen by. Take this hint and do the same, (but not necessarily with 13 rigs out). Especially when working “scattered grass” rather than a tightly defined line, you should make it a point to get a larger buffet set out if you want your breakfast invitation answered. I am now personally dragging three Daisy Chains in my five to six line spread. I drag a spreader bar rig when it is fairly calm and/or I have at least one helpful person aboard. It does produce well, but on a particular day I had in 2009, we caught 8 fish on a Green/Yellow Bone Head Stinger Chain behind our 9” Mackerel Bird, one fish on a Rainbow Spreader Bar Rig, and zero on any of the four single baits behind the boat. Several other days with only one or two Daisy Chains out have ended up with 80 - 90% of all trolling fish caught on a Daisy Chain. This is why I am now dragging three. For the record, I have not trolled any "Meat" (no Ballyhoo, Mullet, Strips, etc) since 2009 and we have been doing extraordinarily well. This is not to suggest trolling Ballyhoo or other meat is not good, but you can be very successful without it. My suggestion is to drag no fewer than two Multi Bait rigs, whether they be Daisy Chains or Spreader Bar Rigs. Troll them from the corners on flat lines about twenty feet back of your prop wash. Troll a Single bait (or another Daisy Chain) in the center 15 feet in front of these (or 5 feet behind the prop wash). For me in the past, this is usually a Tuna Bandit or a Marlin Lure, but lately I have been dragging a Daisy Chain in this position. Then, troll two other baits each around twenty feet behind each corner rig. These could be single lures from flat lines or Ballyhoo from your riggers. Then troll a single bait WFB (Way Freakin Back) around 150 - 200 feet behind the boat. I will use a Wahoo rig if they are around, or a Tuna Bait if they are around. My usual bait in this position is a Steel Head as it catches everything and it is exceptional on everything. I can almost guarantee that your success will increase by adopting Daisy Chains as your "Go to" baits when targeting Dolphin, Wahoo, and Tuna. You will also likely find that a Sailfish or Marlin might eat one if you drag it by one. Not at all. A Daisy Chain is simply a leader threaded through lures along the length of the leader so there is nothing to tangle. Spreader Bar rigs will tangle (a little) but you really have to try to tangle them. They are so easy to deploy and retrieve as with squids or lures threaded onto (not tied to) the main lines, it is nearly impossible to foul these beyond twisting two main lines together which might take you 10 seconds to free up. Back in the day when we tied natural baits to the main lines, each individual bait could then twist around another main line or another bait, and this could be troublesome, but not the case with the new rigs…. That’s ok. Use Daisy Chains as teasers to get the fish into your spread and once there get your natural single bait or fly in front of him. One of our best sellers (and hailed by some charter boat captains) has been our “Warrior Teaser” (easily handled by the “Weekend Warrior”). This teaser has a chain of four Bone Heads being chased by a 9” Bowling pin lure. It simulates a small predator thrashing about trying to get a meal. If you add two of these (or similar chains) to your spread and keep everything else the same, you will undoubtedly see an increase in your productivity. How much will this cost me?? The cost of trying out Daisy Chains and adding them to your repertoire is very inexpensive, however, you will likely begin to purchase or make more to suit different species and have various colors choices available, but as a good chain will last many, many trolling hours and fish, the cost will be far less than you might currently be spending on Ballyhoo. The average price of a productive and durable Daisy Chain costs about the same (or less) as 3 dozen unrigged Ballyhoo. A good Daisy Chain will last hundreds of trolling hours and quite possibly more than 50 fish while three dozen Ballyhoo will last only 72 hours and probably produce only 8 - 10 fish. An inexpensive Daisy Chain packaged in a single pocket mesh lure bag can be as low as $15 and a really inexpensive one without a bag might be only $10. Many chains with more expensive lures used can cost as much as $80 or more but are seldom more than $50. A good Spreader Bar Rig with 9” or 11” squids will cost around $70 - $90. Rigged with more expensive lures, this will go up. If you make up your own rigs, it will vary depending on the line size, the baits, the hooks used, etc but you can make up a Daisy Chain with four 5” skirts and a 7” lure with 130lb mono, and a single strength hook for around $8 - $9.00. I do not suggest making up your own spreader bar rigs until you learn how they work and how you might improve on (or customize) what you can purchase. To make up a Daisy Chain yourself, first decide what species you will be targeting. Decide what colors you will want to present. Decide how large you want the hook bait to be and then choose a smaller or same size model for the “Teaser” baits. The cheapest way to start is by using shell squids of “Octopus” skirts and then a larger shell squid or trolling lure at the end. The best way to keep your teaser baits on the line is with the largest plastic bead you can fit inside the teaser squid with a single width (round) crimp behind it. Place your teaser baits around 2 – 3 times the length of that bait apart and place your “hook” bait with a couple more inches space between it and the last teaser bait. Many times in the past, I would attach a wire to rig a Ballyhoo behind the “Hook bait” lure, but I haven’t done this in more than four years after proving to myself the productivity without meat. To store your Daisy Chains without tangling, simply pick up a single pocket lure bag at your local retailer, or if this doesn’t fit your budget, use a Freezer zip lock type bag. Yeah, sure… But really, if you do start fishing multi bait rigs every trip, you will see a definite increase in your catches. With Dolphin season starting up again (it never really ended) there is no better time to put this into practice and start producing catches. Be advised that even if the fish does not eat a Daisy Chain, that does not mean the chains didn’t help to bring that fish into your spread. When asked by sailboaters or newbies with only two rods what would I troll most of the time, the answer is always, one Daisy Chain close to the boat, and one Steel Head (.6 oz Mylar skirted Bullet head) way back. Now go dig up some skirts, mono, a lure and a hook and put one together or stop by your local tackle shop and have them provide one to you. You don’t have another trip to waste offering only single baits when clearly, more is better…. Fishing with Spreader Bars is easy. They do not get tangled (unless you try) and will lay in the edge of the deck when cleared to catch a fish. Spreader bar rigs are highly productive and should be used anytime for Tuna, Dolphin, and even Billfish. Remember, More bait, More fish!